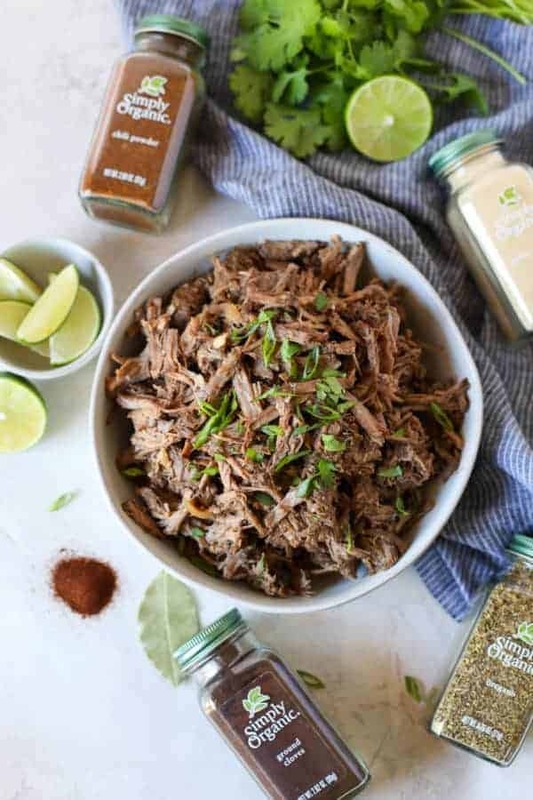 Tacos, taco salads, burrito bowls, egg scrambles…the options are endless when it comes to this tender, perfectly spiced slow cooker beef barbacoa. What do you put on the menu when the week ahead is busy, busy, busy? Tacos. The answer is always tacos. Tacos are almost universally loved, they’re easy enough to prepare and they can be enjoyed in an almost infinite number of ways. 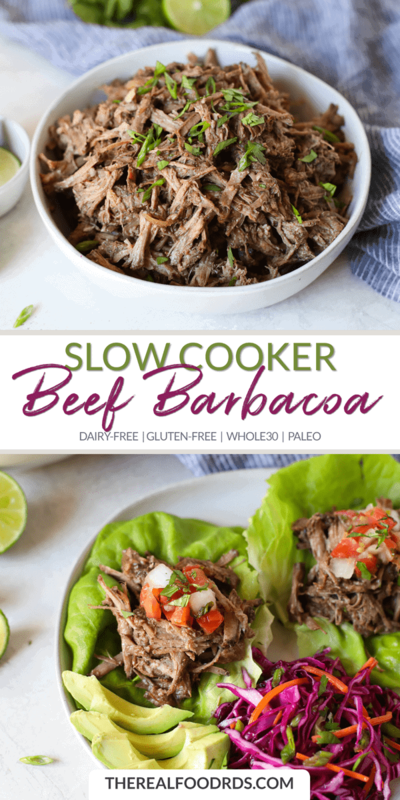 And since today is Tuesday and it also happens to be another ridiculously busy week at our house, I bring you the ultimate busy weeknight solution: Slow Cooker Beef Barbacoa. 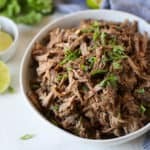 This Slow Cooker Beef Barbacoa is, in my mind, the ultimate solution in that it’s so simple to prepare. 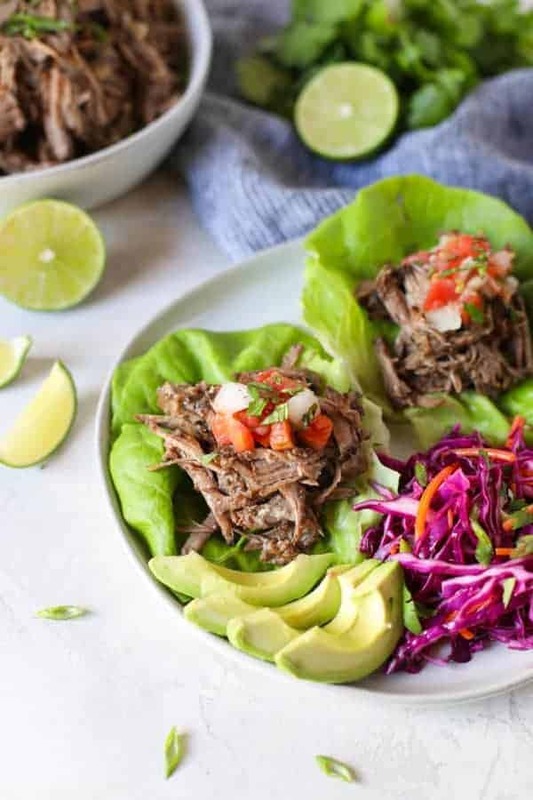 In less than 15 minutes you can have everything loaded into the slow cooker (or a zip-top bag so it’s ready to dump into the slow cooker when you’re ready) and in 7 hours, you’ll have a big batch of the most tender and tasty filling for stuffing into tortillas and lettuce wraps or piling atop a bed of cauliflower rice, salad greens or rice. It even makes a big batch so you have plenty to freeze for an easy reheat-and-eat meal later on in the month when you just can’t wrap your brain around cooking (<< that sounds like me this week). Take the easy way out this week. 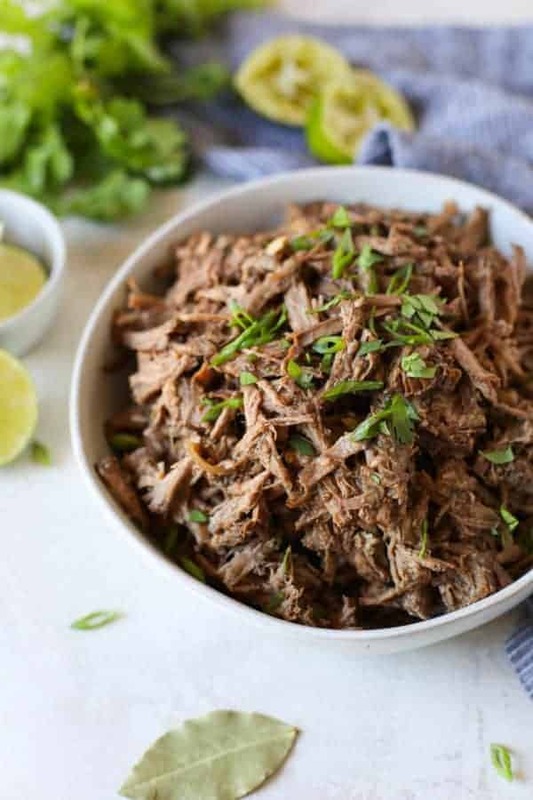 Notice I said easy and not flavorless because this Slow Cooker Beef Barbacoa is anything but flavorless. 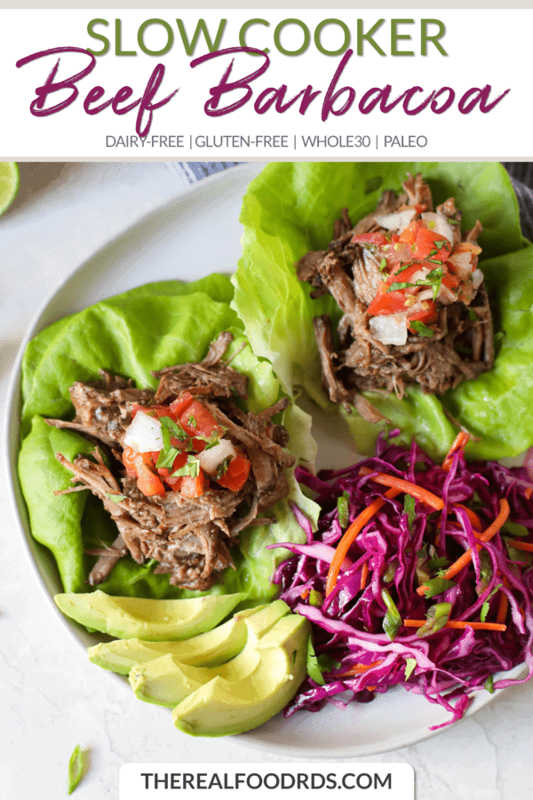 In fact, it rivals the barbacoa you’ll find at a certain fast-casual Mexican restaurant chain that’s pretty popular with those doing a Whole30, those with busy lives and well, just about everyone looking for a Mexican food fix when they’re short on time. Try it paired with this Mexi Slaw or our Homemade Guacamole for a better-than-takeout and easier-on-the-budget meal this week. Total Time: 8 hrs., 15 mins. Place all ingredients in the slow cooker. Stir to combine. Place lid on slow cooker and cook on LOW for 8 hours or HIGH for 4 hours or until meat is tender and shreds easily. Taste and season with additional salt and pepper as needed. Serve in lettuce wraps or stuffed in a baked sweet potato with toppings of choice. What’s your favorite busy weeknight meal? Share in the comments below! Pin this & Share the love! How long would you put this in an instant pot? And what setting? You can toss everything into the pot, stir and cook on ‘Manual’ or ‘High Pressure’ for 60 minutes with a 15-minute natural release. How would you convert these directions for an instant pot? 2. Lock lid into place and set vent valve to ‘sealing’. Set cook time for 60 minutes (high pressure). When cooking time is up, allow for 15 minutes of natural pressure release before flipping the value to ‘venting’ to release any remaining pressure. 3. Carefully remove the lid and transfer beef to a bowl or baking dish. 4. Shred meat with two forks then taste and season with additional salt and pepper as needed. We’ll get the nutrition info added soon. Would this work with pork shoulder? Yes, this works great with pork shoulder. Sounds delish! How long do you recommend in the crockpot if you’ve got 2 lbs rather than 3? You could cook it for the same time. Or you could check it once it’s getting close to the end of the cooking time. If it shreds easily then that’s a good indicator that it’s done.